STUART, Neb. -- When Byron Steskal first saw it on the land where he was born nearly six decades ago -- land that his parents bought for $5.15 an acre -- he recalled writing down a statement on Post-it notes before calling the sheriff's office. It was still standing, just inside the fence that marks Steskal's family property, during his trip home with a reporter on a recent summer afternoon. Scribbled on the bright pink surveying stake were two letters, "T.C.," that he couldn't help but read as a message. With the heft to carry half a million barrels of oil daily, the $5.3 billion Keystone XL pipeline is a huge proposal. But behind the furor over it lies an even bigger question: How should America approach the massive fuel reserves that its northern neighbor is working overtime to tap? Click here to read the report. As the farmer-turned-trucker saw it, T.C. stood for TransCanada Corp., the sponsor of the Keystone XL pipeline that is slated to carry Canadian oil sands crude across his land. The stake, Steskal said, seemed a pointed reply to the sign he had long ago posted inside his fence. "NO Trespassing," it reads. "ESP[ecially] TransCanada." Steskal and his neighbors are the newest infantrymen and women in the long war between pipeline-resistant landowners and a company committed to delivering more than 800,000 barrels a day of heavy Canadian fuel to U.S. refineries. TransCanada had reached easement agreements with more than 90 percent of residents in the path of its controversial pipeline before agreeing to steer Keystone XL around the delicate Nebraska Sand Hills. Looking only at the newly rerouted corridor, that number falls to more than 70 percent. The difficulty is no accident. Pipeline foes in this agriculture-rich state are marshaling behind a new Nebraska Easement Action Team (NEAT), led by a prominent trial lawyer, in a bid to work out the best possible common easement deal with TransCanada. The project was designed to include both landowners who object to the pipeline outright on environmental or economic grounds, and those like Steskal, who doesn't oppose its construction so long as the route is moved farther to the east, parallel to the XL line's predecessor. But NEAT gives the same advice to every rancher on the route: Don't let anyone on your land, even for a preliminary survey. Don't be tempted by signing bonuses. "I do not think negotiating an easement will prevent the construction of the pipeline," David Domina, whose Omaha-based law firm is working with NEAT, said in an interview. "If this pipeline is going to be built and it's going to cross Nebraska, then either TransCanada is going to give landowners terms to save money and hassle, or they're going to take exactly what they want. If people don't organize, they're not going to have any effect one on one." NEAT faces no shortage of obstacles to its goal of winning pro-landowner concessions from TransCanada. The fiercely independent locals of north-central Nebraska, where the soil remains easily unsettled beyond the state's official Sand Hills boundary, are often as leery of the legal system as they are of the Legislature that in April agreed to let TransCanada invoke eminent domain following the governor's approval of a final route (Greenwire, July 10). 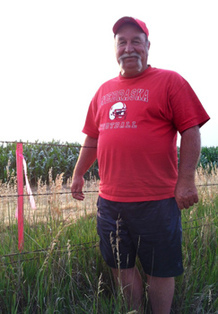 Byron Steskal on the border of his family's land near Stuart, Neb., where he recently discovered a foreign pink surveying stake inside the fence line. Photo by Elana Schor. "That was the straw that broke the camel's back, because now you aren't going to have a choice," said Steskal, who tearfully admitted he would sell his family's land to avoid witnessing Keystone XL laid beneath it. "Now my goose is cooked." On the other side of the table, TransCanada is already familiar with Domina from his representation of three landowners suing the state to invalidate that eminent domain law, a court battle joined by environmentalists. Company spokesman Shawn Howard acknowledged the "challenge" of working with landowners "in a charged environment when there are groups out there spreading information that is not even close to being true." Among the biggest flash points is the question of liability in the event of a spill or some other pipeline accident. A sample easement distributed to some Nebraskans in the pipeline's path commits TransCanada to covering any damage it causes but holds property owners liable for "negligence, recklessness or willful misconduct" caused by them or those "acting on [their] behalf." The company has never required a landowner to take out an insurance policy in the event of an accident, Howard said. "If there's any damage, we're responsible for all of it," he said. Domina warns NEAT members, however, to accept liability only in the event of "intentional and willful acts of destruction." If a farmer accidentally hits a pipeline on his land, the lawyer added, "it isn't just a mile across your place that's closed. What's the cost of shutting that pipeline down for an hour, for a day?" The only insurance company that would sell Nebraska ranchers a policy big enough to cover that damage, Steskal joked, is Lloyd's of London. Several miles north of Stuart, retired surgeon Richard Miles and his daughter, Kathy Miles Burnham, opened their initial easement offer from TransCanada to find a surprising addition. If they signed a deal within 45 days, the company was offering an "accelerated acquisition bonus" of $15,000 per mile. The bonuses, a new feature on easement offers that Howard of TransCanada described as "a smart thing to do" to speed up negotiations, did not have the desired effect. "We really don't have anything to say to them at the moment, other than that we just don't want them to come across here," Miles said. Like many of his neighbors, the politically conservative Miles questions the state's choice of a government-developed Sand Hills boundary that allows TransCanada to build across his sandy soil. But his concerns extend to some of the most contentious questions involved in the typically secret process of easement negotiations. Skepticism in the Cornhusker State has propelled a highly political debate over the future of TransCanada Corp.'s $5.3 billion pipeline. From property rights to environmental upheaval, E&E looks at what motivates the unlikeliest of oil sands critics. Click here to view the slideshow. During a recent interview at his home, Miles predicted that his property would become "less desirable" at the end of Keystone XL's estimated 50-year design life, or if the company chooses to stop sending oil sands crude through it sooner. In that event, he said, "I'm stuck with a pipeline full of caustic materials that I've got to take care of. ... I don't know how much they'd have to pay us to be comfortable with something like that." Environmentalists are protesting in Michigan over Enbridge Energy Partners LP's plans to leave in the ground portions of its Line 6B, which spilled 800,000 gallons of heavy fuel in 2010, while installing new pipe that doubles the oil-shipment capacity on its network (E&E Daily, July 10). Miles and Burnham say they plan to work with NEAT, whose members are told by Domina that working in a bloc is the only way to coax TransCanada into considering commitments such as removing the XL line from the ground once its life ends. The company, however, is setting its sights on the more immediate goal of narrowing the 2,000-foot-wide corridor it has submitted to the Nebraska Department of Environmental Quality (DEQ) down to a 150-foot-wide path that ultimately will determine where Steskal, Miles and other landowners could see construction equipment cross their fields. Getting surveying access -- the privilege currently denied by Steskal's personalized "no trespassing" sign -- is a crucial element of that work, Howard said. "Obviously, if someone's got a watering hole for their animals, we don't want to impact that," he added, assuring hesitant locals that "no one has a stronger interest in making sure this pipeline runs safely than TransCanada." The latest round of easement offers delivered to landowners in Holt County, a locus of XL resistance crossed by both the pipeline's old and new routes, includes a $500 "time and inconvenience" payment for each section of property that the company aims to survey. Such a profit might well appeal to ranchers who remain unsure about signing a broader easement with TransCanada, particularly given the record-breaking drought that has sapped farms across the Plains. But NEAT spells out in stark terms what a simple surveying visit might mean for the company, warning landowners that the tax identification data needed to process initial payments could allow TransCanada to view their Social Security numbers. Under the eminent domain law cleared by the state Legislature this year, condemnation proceedings against landowners cannot begin until Gov. Dave Heineman (R) signs off on TransCanada's revised route, now being reviewed by DEQ in a process not expected to end before 2013. That leaves NEAT's organizers, both those who oppose the pipeline and those who merely oppose its route, left to persuade their neighbors to come on board the Domina-led talks. In addition to commonly cited wariness of turning to the courts for help, they also must contend with a more silent segment of the state that has no quarrel with TransCanada's negotiating style or its 1,179-mile pipeline. Three hours south of Stuart, farmer Brian Blase signed his easement early on in the 4-year-old process and praised the company as fair in a recent interview. Blase recalled joking with his TransCanada land agent that since "you're taking my land," he should get a small cut of the Canadian crude flowing through Keystone XL. But more important to the 52-year-old Republican than oil profits is the principle that the land should be free to use without government regulation that he described as punitive. "It's here for man's use," Blase said of the ground set to host the pipeline. "The earth heals itself."